Falling For The PRINCE OF THE PLAYHOUSE-Review and Giveaway! Hi there! I’m so excited to share my review for a new contemporary M/M romance from Tara Lain. As you know I adored KNIGHT OF OCEAN AVENUE and KNAVE OF BROKEN HEARTS, so I couldn’t wait to read PRINCE OF THE PLAYHOUSE. Catch the excerpt, my review and enter to win the $25 GC in the giveaway below! Food arrived. Ru had ordered the salmon, one of his faves, and Gray copied him. Merle had gone for Rick’s famous fish sandwich, as had most of the others. As the waiter placed the plates in front of Ru and Gray, Gray’s napkin dropped to the floor between his legs. He scooted back, spread his knees so he could reach between them, and managed to press the full length of his hard-muscled thigh against Ru’s. Perfect paralysis. Don’t move, don’t speak, don’t make him aware of what he’s done. Shocks of heat streaked into Ru’s balls, and he enjoyed the boil. Gray snagged the napkin, scooted his chair back in, and—didn’t move his leg. From knee to hip, his long limb rested fully against Ru’s. Didn’t he notice? Was being pressed against another man normal for him? Maybe an action-star thing? Forget about food, conversation, breathing. Don’t miss a moment. Artie started talking to Gray about some entertainment industry thing. Gray ate heartily. Nothing abnormal or extraordinary going on in his universe. Ru pushed his salmon on the plate and gazed into near space, every ounce of his consciousness living in his tingling flesh. “Oh yes.” He liked Merle. He didn’t want to wish the guy would shut up so he could listen to the sound of his balls expanding. The others laughed, and Merle joined in. Ru sat back and smiled. Even while he’d been rapping, Gray had never moved his leg. If anything, he’d pressed it harder against Ru. Jesus, he wanted to pull Gray to his feet and press more than their legs together. He nodded. “Why, thank you, lovely lady.” It made him feel a little squirmy to think he was lusting after this woman’s boyfriend, but maybe she and Gray had some kind of agreement? Ru didn’t move. Even his heart must have quit. He couldn’t hear it beating over the rushing in his ears. This is the third book in a series, but can be enjoyed on its own. Ru Maitland is a man of fashion talents, and the right-hand designer to stylist Shazam, MC of the first book in the series. Ru has an unhealthy obsession with action movie star Gray Anson. Gray is a bit of a beefcake, but that turns Ru’s crank. Life and love collide when Ru agrees to make the costumes for a charity run of Hamlet at the local playhouse…starring Gray Anson. Between Ru and Gray there is a definite attraction, and Ru won’t even entertain the idea of dating someone else–and there are suitors. Merle, one of Gray’s out co-stars in the play is smitten with Ru. Oh, and another man from Ru’s past would like to be open with him. This book took a few turns I didn’t expect, dealing with topics I don’t often read. One was police profiling, which happens and is unpleasant–in real life and the book. I also found the street gang issues to be unexpected and interesting. I don’t feel like there is enough representation of gay life in the Hispanic community, and I liked how Ru and his buddy came from very poor backgrounds to achieve critical and monetary success in their lives. That’s a powerful message, and it’s seconded by the fact that these men live an out-gay life, as well. I feared that the gang aspect would drift into caricature, and was grateful when it did not. I liked Ru and I liked Gray, but I didn’t like the way Gray treated Ru, much of the time. Mostly, Gray had problems with Ru’s many admirers, and hoe he felt like it was okay for himself to have a “beard” but not for Ru to have a boyfriend. Ru didn’t want anyone besides Gray, but felt being true to a man he’d barely see and could never publicly acknowledge would be too difficult. I can only imagine the pain in that scenario, and Ru certainly felt some of that pain, which was hard for me as a reader to forgive, if you will. There are moments of the book that felt a little silly, for me, and much of that had to do with Ru’s hand-to-hand combat skills which were hard to comprehend, even with his childhood. I couldn’t reconcile the button-counting mama’s boy with the switchblade-toting gang member–in the given context. That said, it was an interesting attempt, and I loved the depth of character. I also had trouble with the ages of the characters–they are barely mid-twenties. They have accomplished SO VERY MUCH in such a short adulthood, that I’m almost shamed by my lack of success…it seemed to me more believable if they were just a touch (five-ish years maybe) older, because they would then have a bit more gravitas and emotional maturity, which would have made their banter fit their characters better. There are some serious elements of mortal peril, and bad publicity, and a tender coming out, for Gray. That was far lovelier than I had expected, in truth. I really enjoyed all the play aspects, and how Ru and Gray built a love quietly and privately–all while balancing Gray’s life in the public eye. Those fame aspects felt very true, and a bit sad. I’ve really enjoyed this series, and I’m anxious now for sweet Merle to find himself a man to love. He seems to deserve one. Interested? 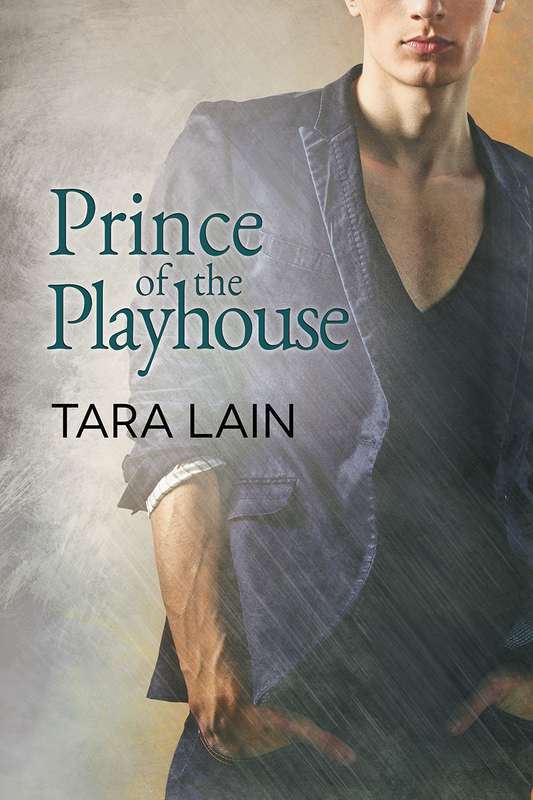 You can find PRINCE ON THE PLAYHOUSE on Goodreads Dreamspinner Press (ebook or paperback) Amazon, Barnes & Noble, IndieBound, Kobo, and AllRomance. Click on this Rafflecopter giveaway link for your chance to win a $25 GC!